Bernadette Parsons is one of New Zealands foremost watercolourists, she has been painting for 20 years and has had enormous success in winning many awards with her work. 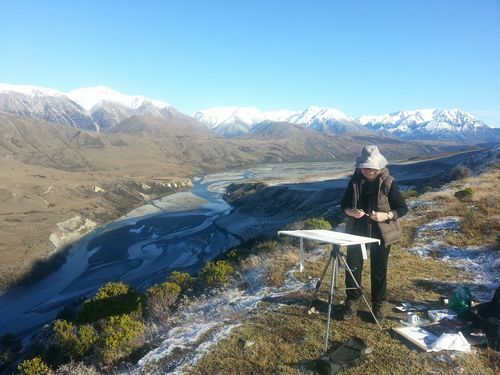 Her home is in the Whangamarino Wetland area in Mercer which encouraged her to begin painting humble landscapes with a passion, trying to use a freshness and simple approach that makes her landscapes unique. She feels watercolour is a medium that you work with in a partnership, allowing it a freedom which create never to be repeated happenings. "Spontaneity is something I value most in my paintings as this is what will make them special", Bernadette says. She enjoys the excitement people feel when trying the medium and gives classes from home in small groups in her studio and plein air. With friend Erin Mcrobbie she also organizes Watercolour Plein Air trips & workshops around New Zealand. Please check News Calendar to find out about special painting workshops she'll be running. Bernadette Parsons work is in private collections here and in Europe and Australia, and been published in painting books. Explore Bernadette Parsons online gallery, and if you have any enquiries please email. 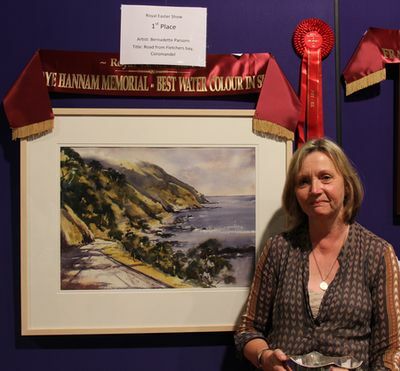 At New Zealand Watercolours premium Splash exhibition in 2014 she received Supreme Painting in Show.